Marcus begins by welcoming you and discusses the intent behind the series, and reveals the track that will be featured. You'll then get workflow tips and suggestions that will help when dealing with notation based score in your productions. Next, Marcus shows how to get the MIDI data from your notation software into your DAW, as well as how to import a MusicXML file created by another notation program and tweak it further. Marcus then imports the audio mix into Notion to develop the score further, and adds 3rd party virtual instruments for further sonic choices. 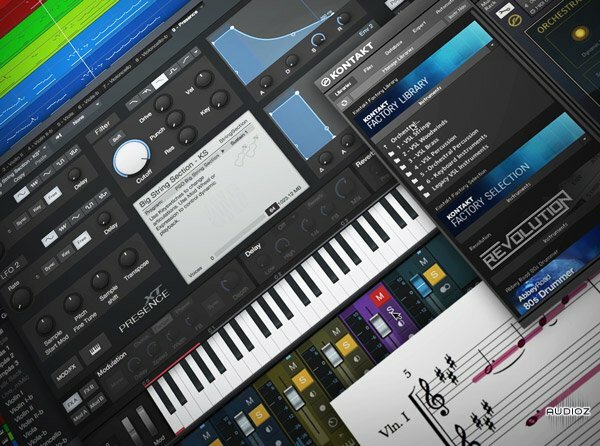 Moving on, you'll explore articulations and playing techniques and how they affect keyswitches, followed by how to add humanization to your score, and see how to export the score along with its virtual instruments into the DAW session. Mixing is next, and Marcus shows how to set up the rough mix as well as basic routing and effects, and then shows how to adjust velocities to create a realistic balance between the dynamics of the virtual instruments and the rest of your production. You'll also see how to layer and add additional VIs, making parts sound huge by creating orchestral layers, using expression and modulation continuous controllers for added realism, and lastly, videos on using Logic Pro X and Pro Tools stock virtual instruments when working with score. See the individual tutorial descriptions for more info. If you want to learn about taking a string arrangement that was recorded in a notation software program and moving it into your DAW for the final production, this is the series to watch... Checkout "Producing an Epic String Arrangement from Score" today! Groove3 - Producing an Epic String Arrangement from Score has been exclusively released on AudioZ by ilfsn who chose to ask not to post mirrors. Yeah, Notion 6 is great staff+great integration with S1, which is nobrainer. I wish we had it. Thanks for this goodie I wish we had some other links like Rockfile or uploadboy.